Ufford Park is a large purpose-built complex on 120 acres of parkland, just outside the pretty Suffolk town of Woodbridge. The health club facilities include a 15-metre pool, sauna, steam room and hot tub, but step through to the spa area for a more peaceful experience. The quieter facilities – only available for spa guests – include a white-mosaic hydropool, sauna, mineral grotto, aroma steam room and an ice bowl for the brave. Try unusual and good quality Babor face and body treatments. 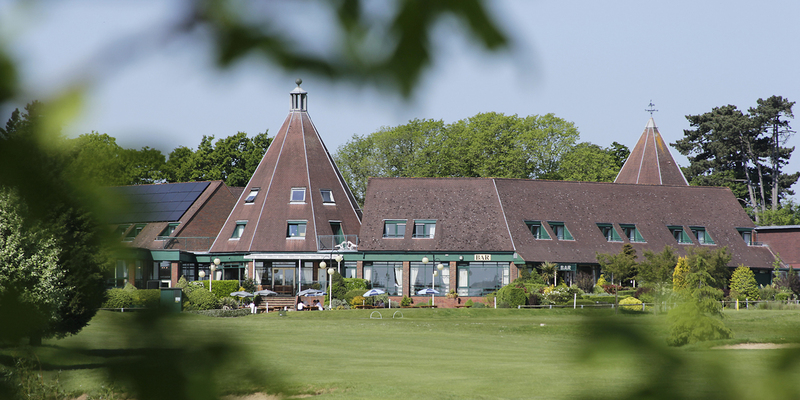 Ufford Park is a purpose-built, red-brick golf club, health club and spa near the pretty Suffolk town of Woodbridge, a short drive from the popular Heritage Coast. Turn off the road and follow the signs for the health club to leave your car right outside. The car park was extremely busy on a Wednesday morning, testament to the spa's popularity. The leisure club's reception lounge is light with sofas, tables and chairs, and windows overlooking the golf course. If it's a nice day, head outside and sit on the terrace. While this room is perfectly functional, it could do with a facelift -- think 1970s carpets and furnishings. Staff at the reception desk warmly greeted us. We sat on a sofa to complete a consultation form, select a 30-minute treatment from the menu, and pre-order lunch. We were then invited to select one of four foot salts (tangy mandarin, please) and handed a branded plastic bag containing a robe, a towel, slippers and a sachet of our chosen salt. Changing rooms are large with full- and half-height wooden lockers operated with a new £1 coin. Change on slatted benches or nip into one of four glass-fronted cubicles. To the right are four showers with soap attached to the walls (no shampoo or conditioner). A vanity bar has white leather stools and hairdryers (but no amenities). Parents with babies can use the changing mats and nappy bins provided. The health club has a 15-metre pool, a good size for swimming lengths, although it was really busy on our visit, despite it being adult-only time. (Check the website for children's swim times). There are a few wooden chairs to one side of the pool's perimeter but no loungers. Large windows overlook the golf course. On the other side, you'll find a sauna, steam room and circular bubbly pool for children, which has an attractive mermaid painting on the ceiling. If you're wearing a branded spa robe, you can use the thermal suite (use the plastic card lying on top of the keypad to gain access). Once in, you'll leave the 1970s decor behind and step into a smart space with rustic pebble floors, mosaic-tiled walls, seats and splash-backs in shades of copper, blue, fern and sage. All the facilities are set around a rectangular hydro-pool tiled in green, with two submerged loungers at one end, four bubble chairs at the other and two swan pipes in the centre. Natural light floods in through a glass ceiling. 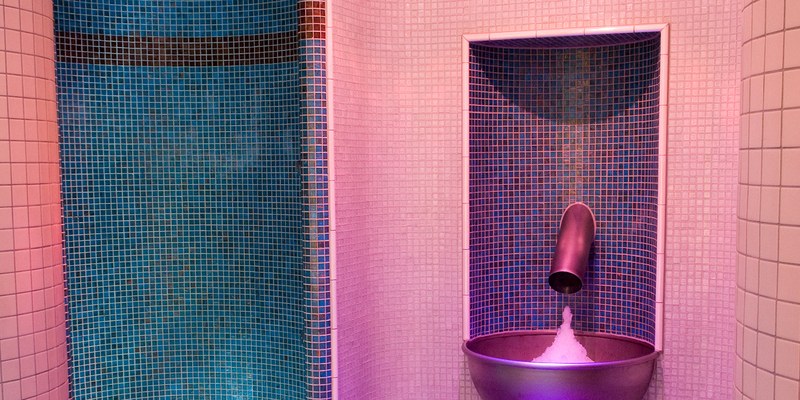 Channel your inner Goldilocks in the aroma steam room with its three settings: relax, restore and revitalise. "Relax" was a bit soft for us, with hardly any scent detectable, but "revitalise", with its fragrant aroma, was "just right". We had trouble leaving the Mineral Grotto, too, with its fern/sage mosaic tiles and dedicated seats for six. Three banks of wooden benches seat eight in the soft sauna, perfect if you don't fancy getting too hot under the collar. Blue and bronze-tiled experience showers book-end a copper ice fountain with "tropical rain" to the left and "cool mist" to the right (perfect after a long stint in the mineral grotto). 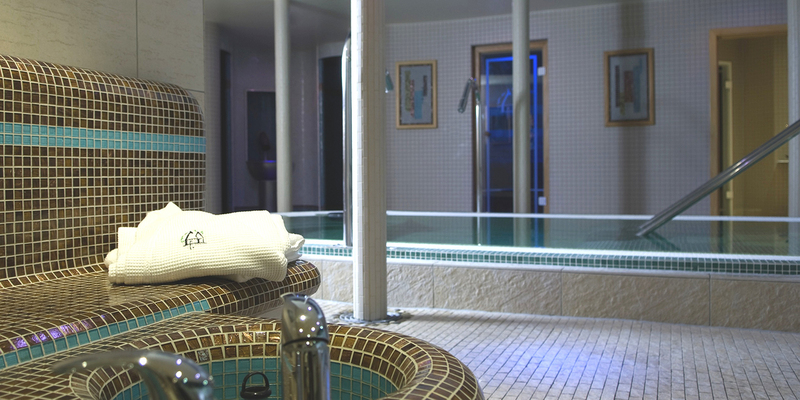 A mud serail room completes the list of thermal facilities. The relaxation area, with brown rattan chairs and tables, is near the two bronze-tiled foot spas, where we got to test our citrusy scrub. Help yourself to a selection of Bircher herbal teas and cold water before settling down on one of five lie-flat loungers to leaf through a selection of magazines or stare up at the black ceiling with its twinkly lights. With no door to close, the hubbub from the hydro-pool can be heard, which isn't particularly relaxing. Make use of the Ufford Park's small gym and a mani/pedi room, too. We tried the Sensational Eyes treatment (30 minutes, £29). My therapist, Hannah, met me in the spa reception area and led me to a spacious treatment room with light wood floors, chocolate-brown walls and a dedicated shower. Hannah talked me through the steps of the treatment and left the room while I took off my robe and lay face up on the warm treatment bed. To begin the treatment, Hannah massaged a Babor HY-OL/Phytoactive Base cleanser into my face, neck and décolletage to remove any residual make-up or grime; it smelled fresh and clean. As she wiped off the cleanser with warm, wet towels, I began to relax. Hannah then used a rose toning lotion to tighten my pores in preparation for a hydrating moisturiser. To tackle the small lines around my eyes, Hannah squeezed a slick of "sensational eyes" cream onto two moon-shaped shaped pieces of foam and stuck them under my eyes. The cream tingled deliciously for a few minutes, convincing me that it was working. When Hannah covered my eyes with a towel and started a wonderful head and scalp massage, I fought to stay awake. After ten minutes, Hannah removed the foam, dotted an anti-wrinkle cream fluid around my eye-sockets and lightly massaged the area around my eyes. One more coat of moisturiser and I was ready to face the day. My skin felt baby soft and the lines under my eyes were noticeably reduced. Ufford Park spa offers a good selection of body and facial treatments, massages, manicures/pedicures, mud treatments and treatments for men and mums to be. We ate in the Sanctuary Lounge in our robe, a dining area that's part of the spa but with no staff. With a corridor running through the middle, and bedrooms at either end, it felt more like a temporary place to eat. Right on time (at 12 noon), the staff member who had welcomed us at reception brought our chosen lunch of warm chicken Peri Peri salad with sun-blushed tomatoes and chutney on the side. You'll also find paninis, jacket potatoes and salads on the menu; you can order alcoholic drinks and desserts at extra cost. There wasn't much on the menu for vegans or gluten/dairy-free guests but you can pre-order special dishes before arrival. 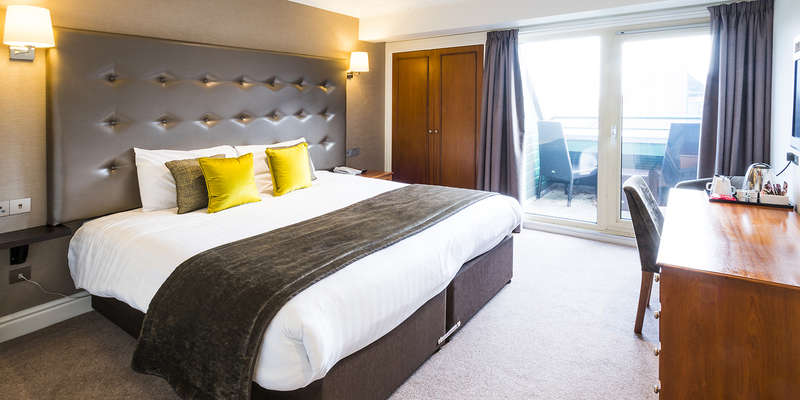 The thermal suite: This is the star of Ufford Park's show with its sunlit hydro-pool and attractive design. The staff: Everybody was super friendly and willing to help -- from the receptionists to the therapists, from the pool attendant to the cleaner. The Sanctuary Lounge: The spa restaurant is an odd set-up, with no staff on hand and a temporary vibe. The plastic bags: Guests receive their robe and towel in a plastic bag; greener alternatives would be preferable. Bargain hunters: With some treatments for as little as £29, the spa at Ufford Park is very good value for money. Tourists: The charming town of Woodbridge and Suffolk's beautiful coast are a pebble's throw away. 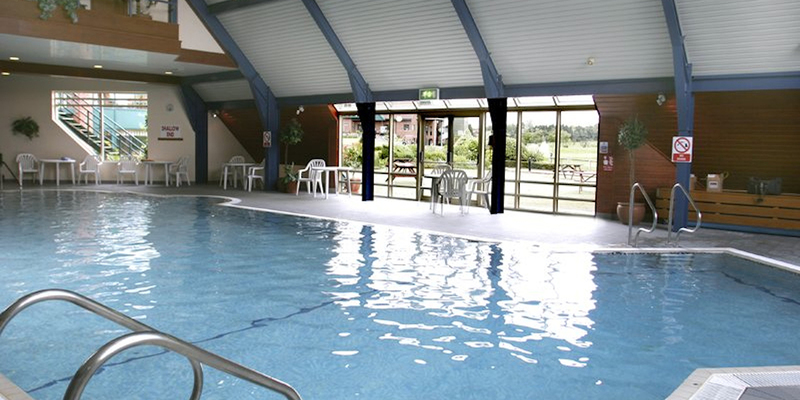 Families: With dedicated swim times for children and changing rooms full of nappy bins / changing tables, Ufford Park spa is a great choice for families. 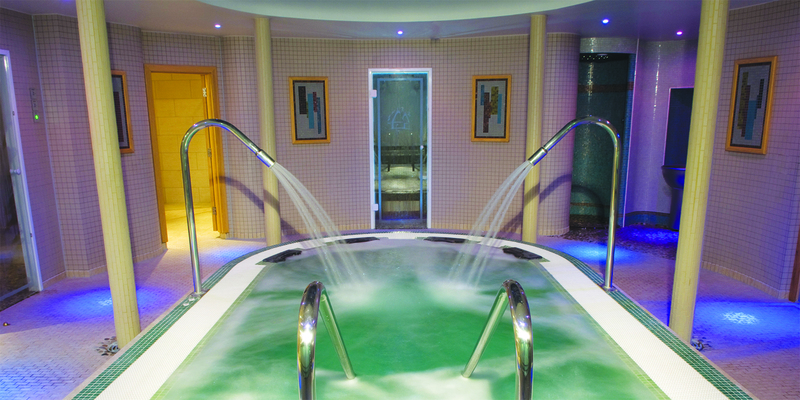 We awarded the spa at Ufford Park a Good Spa Guide Bubble Rating of 3 Bubbles. With its large pool, good range of thermal facilities, and varied treatment menu, it has everything you need for a spa day. A refresh of the reception area and health club would elevate it further. Super Spy visited in August 2017 and awarded it 3 Bubbles. The spa is open Monday to Friday: 9am-8.30pm; Saturday: 9am-7pm; Sunday: 9am-6pm.